We are fighting for life and for the building of hope, to become aware, organize, coordinate our forces, care for the land, for food sovereignty, to fend for ourselves and defend Mother Earth. 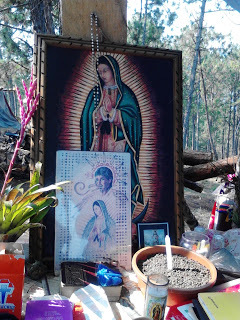 On 28 and 29 July 2015, the believing communities of Margaritas inspired by faith and from the pain and suffering which we experience, we walk to express our disagreement, to join forces, to build hope and to pray to God to help us care for our heritage through Peace for life and against violence and dispossession. We unite our sorrows, we come out to shout them aloud and therefore we ask you to join us for a great pilgrimage from Ignacio Zaragoza- Margaritas- Comitan , to all the peoples who suffer from great injustice and violence, such as Primero de Agosto, displaced by social organizations controlled by the government, Ayotzinapa, Acteal, Banavil, Chicomuselo. People who suffer from the high electricity rates, from the imposition of hydroelectric dams, oil exploration, megaprojects that they want to impose, threats to our territories from the structural reforms, against our native maize; Also we are concerned about violence against women and so much discrimination, divisions in families, so many murders and abductions, poor medical care, increased number of bars (cantinas), repression, corruption and impunity. We are in solidarity with the struggle undertaken by the pueblo creyente of Simojovel, accompanied by their parish priest. July 28, 10:00 am: We start on the bridge of the Zaragoza community near Gabino Vazquez, to walk to Las Margaritas. July 29, 6:00 am: We start in the central park of Las Margaritas, to walk to the barrio of San Sebastian in Comitan.